The following excerpts are taken from the glorious Council of Trent, Sessions V (on Original Sin) and VI (on Justification), promulgated under Pope Paul III in 1546-47. The following excerpts from Pope Pius XI show the orthodox Catholic teaching on the attainment of true peace, which is only possible through Christ and through the conversion of individuals and nations to Him (not something you've heard from the Vatican lately, is it?). Note in particular the absence of any reference to a "culture of encounter" that supposedly arises from Catholics, non-Catholics, and atheists "doing good" as the key to peace. 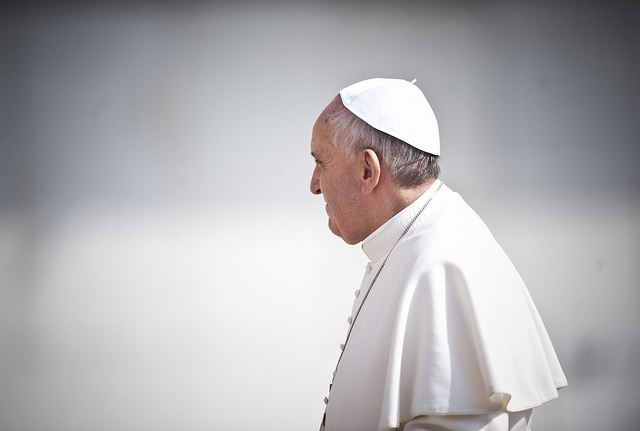 Francis Do-Right: Tom Droleskey demolishes Bergoglio's Sermon on "Doing Good"
Answering an Objection: "Who are YOU to judge who is a heretic?" On Wednesday, May 22, 2013, Mr. Jorge Bergoglio (“Pope Francis”), head of the modernist Vatican II Sect, gave a brief homily to the people in attendance at his “Mass”, which is, thanks to the False “Pope” Paul VI, since 1969, nothing but a Protestant-Masonic liturgical happy meal. Coverage of the sermon with substantial excerpts can be found on the Vatican’s News site here, and it is on this text and coverage that we rely for what follows. The sermon centered on the possibility of non-Catholics and non-Christians performing good works, or, as Francis put it, “doing good”. It’s hard to believe, but the Novus Ordo religion has only existed for some 50+ years. It officially began after the death of Pope Pius XII with the usurpation of the papal throne by Cardinal Angelo Roncalli (1881-1963) on October 28, 1958. Roncalli’s false pontificate was relatively short but long enough for him to prepare the way for the systematic destruction of Catholicism: the appointment of Giovanni Battista Montini (“Paul VI”) as a “cardinal” in 1958 (thus realistically enabling him to become his successor, which is exactly what happened), the establishment of the “Pontifical Council for Promoting Christian Unity”, the Vatican body dealing with ecumenical affairs and relations with Jews (1960), the introduction of the name of St.